Wulfenite (PbMoO4) is as Arizonan as Saguaros, Gila Monsters and Snowbirds…and in 2017 was officially recognized by our Legislature as our Official State Mineral. This puts it in company with Petrified Wood as our state fossil, Turquoise as our state gemstone, the Bolo Tie as our state neckwear and Copper as our state metal. In one way or another all these “official state” designations are an outgrowth of our hobby and Show and reflect the maturing of tastes…with mineral specimens finally getting the recognition they deserve! So why “Wulfenite is Loved”? The answer goes back to the late 60s when some (presumably successful) mineral collector scrawled PbMoO4 is LOVE (no “D”) on an old shed at the Red Cloud Mine…arguably the world’s finest wulfenite locality. Photographs of this graffito appeared in the mineral collecting magazines and spawned bumper stickers (now serious collector’s items) that graced collector’s vehicles until they disintegrated under our fierce Arizona sun. So when our Legislature decided to recognize wulfenite as our State Mineral it seemed right to recognize that love, update the bumper sticker slogan with that missing “D”, and make it our Show Theme as quickly as possible. As it turned out 2019 was as soon as we could do it. Many wulfenite occurrences are characterized by enormous open cavities lined with yellow, orange or red crystals…often growing to several inches across. Until just after WWII, wulfenite was one of our major sources for molybdenum (which gives stainless steel strength at high-temperatures and corrosion resistance) so tragically, some large wulfenite occurrences were mined and processed simply for their molybdenum content. The famous Tiger Mine, just north of Tucson, produced 6.3 million (!) pounds of molybdenum oxide (MoO3) (www.janrasmussen.com/pdfs/Arizona%20Wulfenite.pdf). That means at least 8,500 tons of wulfenite were mined, which jibes with stories of miners raking bright orange wulfenite crystals off the walls and shoveling them into wheelbarrows to haul to the smelter! [For a really scary perspective, this would make a solid cubic wulfenite crystal about 35 feet on an edge] Fortunately, after WWII, metallurgists and miners figured out that it was easier and cheaper to extract molybdenum from the sulfide mineral molybdenite…which occurs in HUGE deposits like the Porphyry Copper mines around Tucson…so our remaining wulfenite occurrences were left for collectors to enjoy. Curiously, for some reason wulfenite does not typically form in molybdenite-rich systems, a fact which has been well documented by scientists at the Arizona Geological Survey…including our own Jan Rasumssen (then Wilt) (See Wilt, Keith and Theodore, 1984: https://pubs.usgs.gov/of/1984/0830/report.pdf). For equally mysterious reasons, Arizona and neighboring parts of northern Mexico are exceptionally well endowed with wulfenite occurrences…including many of the world’s best known: Red Cloud, Glove, Los Lamentos, Rowley, San Francisco, Tiger, Ojuela, Defiance-Silver Bill, Santa Eulalia, Hilltop and Tucson’s own Old Yuma Mine. A good guess is that a combination of long-lived arid conditions and slow, but deeply penetrating oxidation acting on rocks and mineralization of the right compositions led to this preponderance of wulfenite occurrences, a supposition that might be borne out by comparison with other places where wulfenite abounds like the deserts of southern Africa, Iran, Australia and China. Because wulfenite is such an attractive and popular collector species it is very well represented in the mineral collecting literature. Articles focusing on wulfenite in particular regions like Arizona are worth boning up on (cf, see Rasmussen reference above) and Lithography's books American Mineral Treasures and Collecting Arizona that went along with our 2008 and 2012 Shows feature superb in-depth articles on specific Arizona wulfenite localities. Mineralogical Record has featured articles on specific localities practically since its inception (See especially the Arizona and Mexico Special Editions). As always, Rocks and Minerals February issue spotlights our Show Theme, so next year’s issue will feature Arizonan and Mexican wulfenite locality articles written by familiar names…like TGMS VP Les Presmyk…and me! 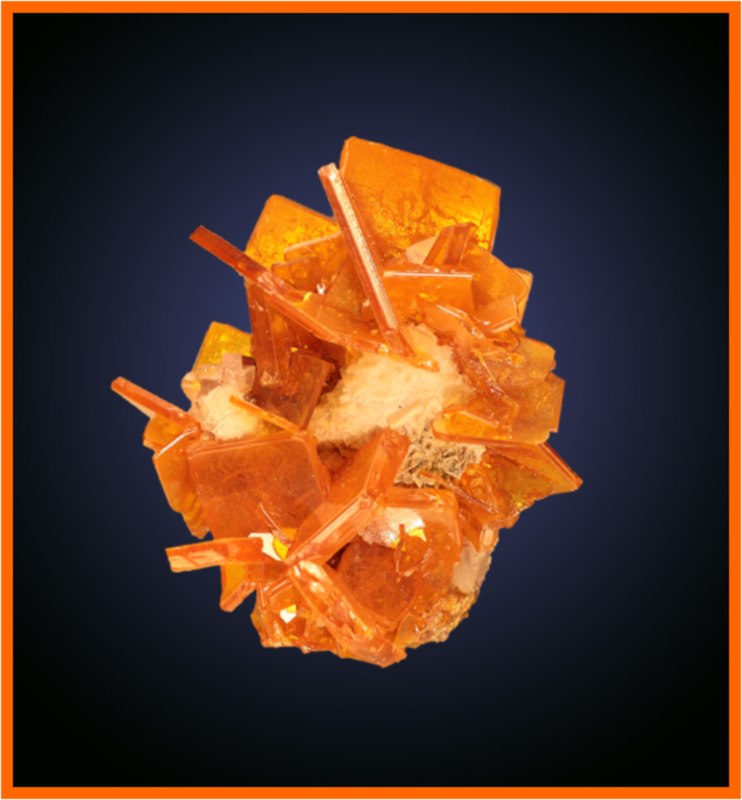 Check out your local library for many colorful and informative resources on wulfenite before the Show so you can amaze your friends with how much you know about wulfenite. If you’re lucky you might get hooked and join the legions of (sure-fingered…the stuff can be fragile) wulfenite collectors…there are almost as many of us as there are fluorite collectors! Newer PostTGMS "Family Fun Day!"